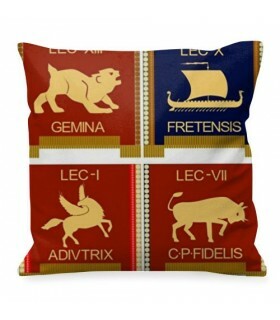 Roman cushions There are 13 products. 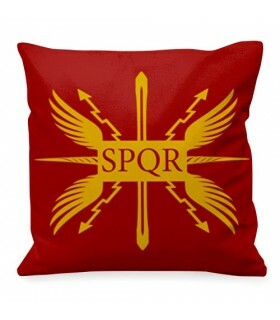 Ancient Roman cushion Republic, SPQR available in various sizes. Made of polyester. Includes stuffing Removable cover suitable for washing machine. li>Maximum washing temperature 30º C. Iron at low temperature.Suitable for dryer.Dry at low temperature.Do not use bleach. 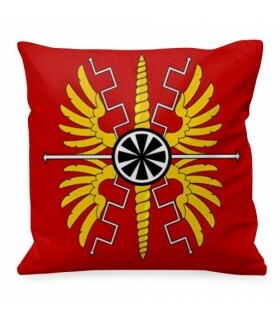 Roman cushion laureate with half moons available in various sizes. Made of polyester. Includes stuffing Removable cover suitable for washing machine. li>Maximum washing temperature 30º C. Iron at low temperature.Suitable for dryer.Dry at low temperature.Do not use bleach. 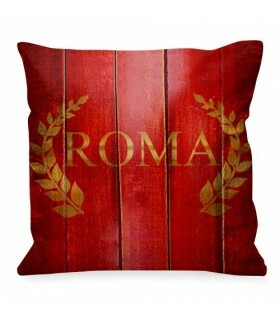 Rome cushion with laurel wreath available in various sizes. Made of polyester. Includes stuffing Removable cover suitable for washing machine. li>Maximum washing temperature 30º C. Iron at low temperature.Suitable for dryer.Dry at low temperature.Do not use bleach. 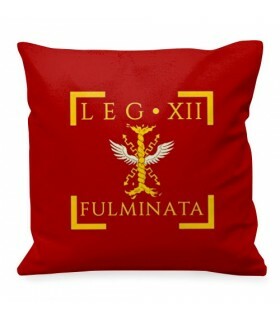 Roman cushion Legio XII Fulminata available in several sizes. Made of polyester. Includes stuffing Removable cover suitable for washing machine. li>Maximum washing temperature 30º C. Iron at low temperature.Suitable for dryer.Dry at low temperature.Do not use bleach. 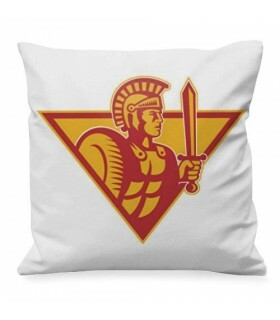 Casco Centurión Romano cushion available in several sizes. Made of polyester. Includes stuffing Removable cover suitable for washing machine. li>Maximum washing temperature 30º C. Iron at low temperature.Suitable for dryer.Dry at low temperature.Do not use bleach. 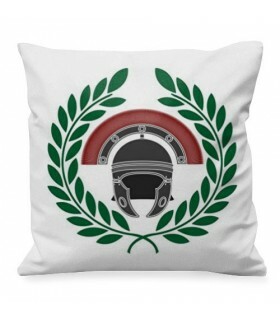 Legion Romana soldier cushion available in various sizes. Made of polyester. Includes stuffing Removable cover suitable for washing machine. li>Maximum washing temperature 30º C. Iron at low temperature.Suitable for dryer.Dry at low temperature.Do not use bleach. 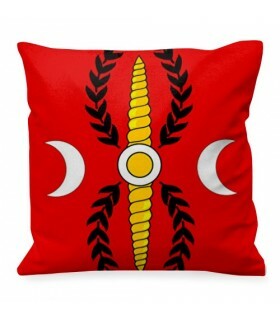 Roman design cushion with half moons available in various sizes. Made of polyester. Includes stuffing Removable cover suitable for washing machine. li>Maximum washing temperature 30º C. Iron at low temperature.Suitable for dryer.Dry at low temperature.Do not use bleach. 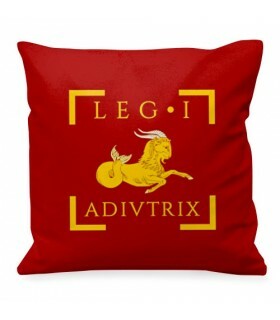 Legio I Adiutrix Roman cushion available in several sizes. Made of polyester. Includes stuffing Removable cover suitable for washing machine. li>Maximum washing temperature 30º C. Iron at low temperature.Suitable for dryer.Dry at low temperature.Do not use bleach. Legio XXII Romani Cushion Deiotariana available in several sizes. Made of polyester. Includes stuffing Removable cover suitable for washing machine. li>Maximum washing temperature 30º C. Iron at low temperature.Suitable for dryer.Dry at low temperature.Do not use bleach. Legio XV Apollinaris Roman cushion available in several sizes. Made of polyester. Includes stuffing Removable cover suitable for washing machine. li>Maximum washing temperature 30º C. Iron at low temperature.Suitable for dryer.Dry at low temperature.Do not use bleach. 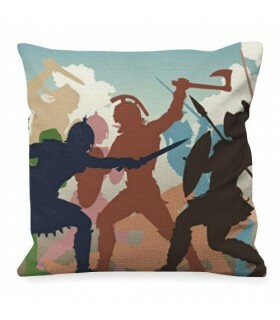 Cushion Fight Roman Gladiators available in various sizes. Printed on 2 sides. Manufactured in polyester. Includes fill.Cover removable, suitable for washing machine.Maximum washing temperature 30 ° C.Ironing in low temperature.Suitable for dryer.Dry at a low temperature.Do not use chlorine.